Nothing warms the heart and soul like rich delicious chocolate. While you wear your winter white, let these unique wedding favors follow suit. 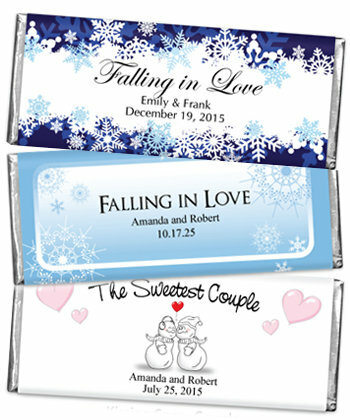 Our winter themed Hershey chocolate wedding favors come in 5 distinct designs that can even be personalized to include your names and wedding date. From exquisitely elegant to cute and adorable, these labels can match the mood and colors of your decor. Sweeten up your guests with winter themed Hershey chocolate wedding favors.